Conical brush homes constructed from living trees, bark and brush, wickiups are primarily associated with Colorado’s Ute People, an indigenous group that dates from prehistoric times to the latter 19th century. 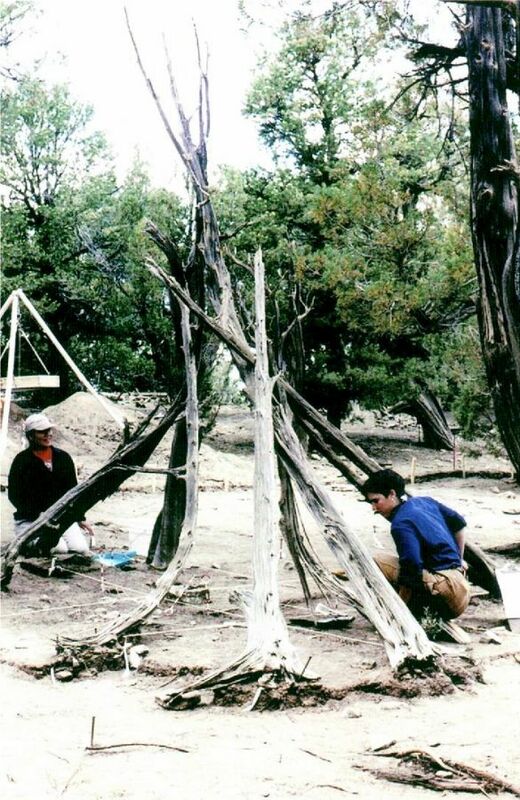 As a result of the Ute’s increased migratory lifestyle in the 18th century, wickiups eventually evolved into more easily transportable teepees. Believed to be the only surviving traditional architecture of the Colorado’s indigenous people, they are disappearing at an alarming rate. Those that remain are critical to the interpretation of the archaeology of historic Ute rancherias. Colorado Preservation, Inc. encouraged creation of a partnership that would consolidate the database information of the Colorado Historical Society, the National Park Service, the Bureau of Land Management, and others to begin the survey, documentation, and preservation process. Dominguez Archaeological Research Group (DARG) stepped forward in 2003 to provide matching funds and a successful grant application to the State Historical Fund, to conduct these studies, now complete. Approximately 500 sites are in the combined database and DARG continues to record these sites throughout the state. A recently-published book by Curtis Martin, Ephemeral Bounty: Wickiups, Trade Goods, and the Final Years of the Autonomous Ute, details the ongoing documentation and history of the sites.